Before you get excited, these are not the kind of pancakes you want to pour syrup over! I guess you could, but it would probably taste weird. They’re actually an entrée savory pancake and the original version is from Africa (Ghana, to be more specific). The traditional variety has corn meal and parsley, but I decided to experiment. The results were Paleo-friendly plantain pancakes with a fun surprising sweet/spicy contrast. This recipe from Immaculate Bites is what inspired me to experiment with tatale. Her recipe has beautiful pictures and is far more authentic than mine, so if you’re looking for Ghanian cuisines, I recommend checking out her post. My version is Paleo-friendly because a lot of folks I know have been participating in a Paleo challenge recently and it’s fun to come up with recipes to share with them. As a result, these plantain pancakes have almond flour instead of cornmeal. I also used cilantro instead of parsley because it’s what we keep at home, and the flavors went quite well together. Plantains do vary, but you should end up with about four pancakes per plantain, so this recipe makes about eight pancakes. This may not sound like very many, but they’re surprisingly filling. These pancakes should easily serve as an entree for two or a starter for four. Peel the plantains and slice them into a medium bowl. If they are as ripe as they need to be for this recipe, you should be able to peel them very easily, though you might need to cut the stem off to get started. Mash the plantains with a fork or potato masher. Stir the almond flour into the plantains and mix thoroughly with a fork, then add in the garlic, ginger, green onion, cilantro, and cayenne and stir to combine. Heat the oil in a heavy bottom skillet over medium-high. Use enough to create a thin film across the skillet's bottom, but you don't need enough to even partially submerge the pancakes. Once the oil is hot and shimmery, use about 1/4 cup of batter each to make your pancakes. If your plantains are very ripe, the pancakes may spread on their own. If your pancakes are not spreading and your batter is fairly dry, use your hands to form the pancakes using measured batter. If the texture is somewhere in-between, flatten the batter in the pan with a spoon or spatula. Allow the pancakes to cook until they're browned on both sides. This tends to take 3-4 minutes on the first side and 2-3 on the second, but you may need to flip each pancake more than once to ensure browning. Add extra coconut oil between batches, as needed, to keep the pan's bottom coated. Like most pancakes, these don’t keep very well in the fridge, so I recommend eating them up while they’re fresh! 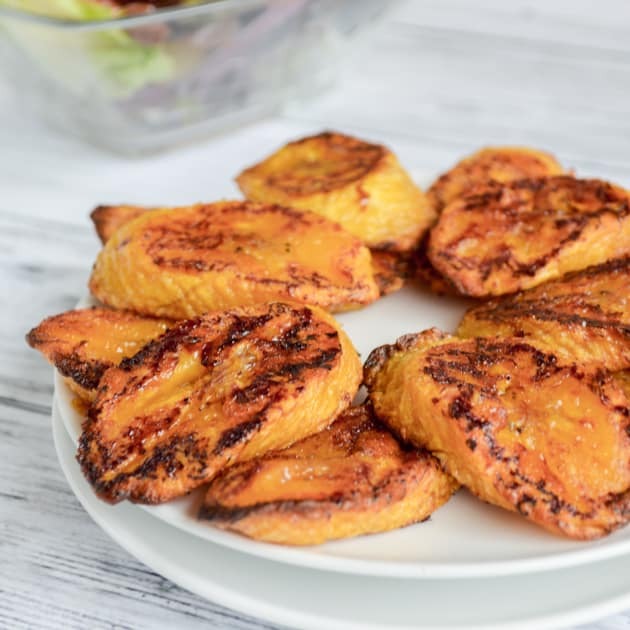 This recipe is a fantastic way to use all those plantains that went from being not ready to eat to overly ripped while you weren’t looking. I’ll always love fried sweet plantains, but sometimes you’ve got to cook something with a little less oil! Speaking of, if you’d like some “Fried” sweet plantains but don’t want all the oil, check out these baked sweet plantains! These look great, I’ve never tried plantain before. Thanks for linking up to Sweet and Savoury Sunday, stop by and link up again this weekend! Thanks so much for stopping by to remind me! I have never tried cooking with plantain and seeing these pancakes, I am wanting to try it soon.